We’d love your help. Let us know what’s wrong with this preview of Fairy Gardening 101 by Fiona McDonald. Release your inner child and step into the fairy world by creating your own enchanted garden, no matter how much space you have! Fairy gardens are increasing in popularity and Fairy Gardening 101 provides you with all the information necessary to design, plant, and care for your very own miniature garden oasis. Author, artist, and fairy gardener extraordinaire Fiona McDona Release your inner child and step into the fairy world by creating your own enchanted garden, no matter how much space you have! Fairy gardens are increasing in popularity and Fairy Gardening 101 provides you with all the information necessary to design, plant, and care for your very own miniature garden oasis. 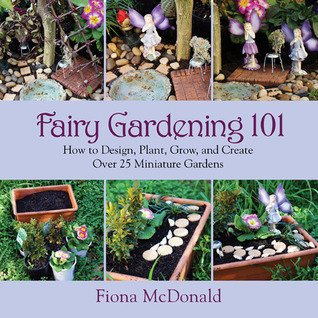 Author, artist, and fairy gardener extraordinaire Fiona McDonald introduces readers to the history of fairy gardens and then provides step-by-step instructions, photographs, and illustrations for you to follow—or draw inspiration from—when starting your own project. To ask other readers questions about Fairy Gardening 101, please sign up. I would love to make some of the gardens from this book. They're adorable and not just because I have a soft spot for miniatures. This purposeful how-to book gives you all the information you need to create a fairy garden, with lists of supplies, suggestions for interesting containers or settings, and tips for successful long-term maintenance of your beautiful creation Need some ideas to get you started on making your very own fairy garden? 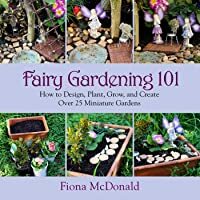 Or maybe you’re already well-experienced in the art of designing fairy gardens and you’re looking for some new inspiration – either way, Fiona McDonald’s Fairy Gardening 101 is for you! Some years ago my youngest child (about age 6) would collect "fairy house" materials and put them on the front step. Magically, over night fairies would come and use the materials to construct a little house and yard. It has now come out that her high school age sister was the master designer. Next my youngest daughter and her next up older sister (about age 10) took to making houses when they visited their cousins. This delightful book is chock full of inspiration for such doings. There are colo Some years ago my youngest child (about age 6) would collect "fairy house" materials and put them on the front step. Magically, over night fairies would come and use the materials to construct a little house and yard. It has now come out that her high school age sister was the master designer. The best of the bunch! This one takes a laid back, anyone can do it, DIY approach to fairy gardening. I really enjoyed it.